I’m so happy to finally have lots of eggplant in my garden! When I saw this recipe at Smitten Kitchen I knew I wanted to do a variation on it. Hers called for orzo pasta and cubed mozzarella, but in interest of making this gluten free, I used cooked rice. And since I didn’t have fresh mozzarelle to cube, I used what I had– blue cheese — then sprinkled it with a Monterey Jack/mozzarella cheese mix on top. I served it for lunch today. My kids gave it mixed reviews; some don’t like eggplant and others are afraid of blue cheese, the silly children. But to my adult taste it was absolutely fabulous. Just thinking of it is making me want to run to the fridge for an afternoon snack. Except I didn’t run today; nevermind. Anyway, here’s my adaptation of the recipe. Hope you love it as much as I did. 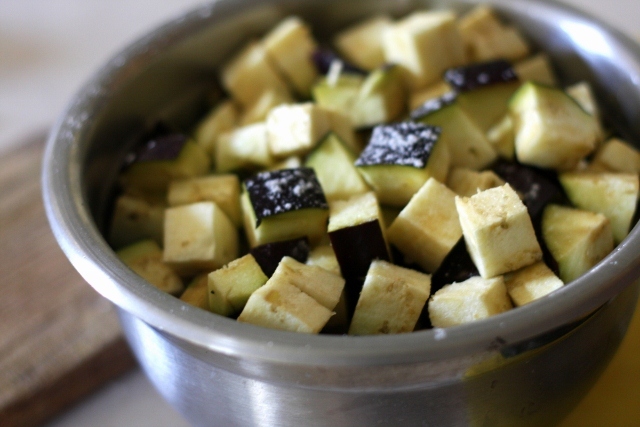 Cut eggplant into cubes, leaving the skin on. Sprinkle your eggplant generously with salt and let it drain in a colander for 30 minutes. While it drains, get your rice cooking (you need 3 c. after cooking) and chop the rest of your vegetables. After 30 minutes, rinse eggplant well and pat it dry on paper towels. Preheat oven to 425Â°F. Heat a large cast iron skillet over medium-high heat. Once hot, add the oil. When oil is shimmering, add the eggplant. Fry 6-8 minutes, stirring pieces occasionally, until it is softening and getting some browned bits. Using a slotted spoon or spatula, transfer to paper towels to drain. Add carrots to remaining oil and cook for 3 minutes before adding onion, peppers and garlic. Cook together for 3-5 more minutes on medium heat. 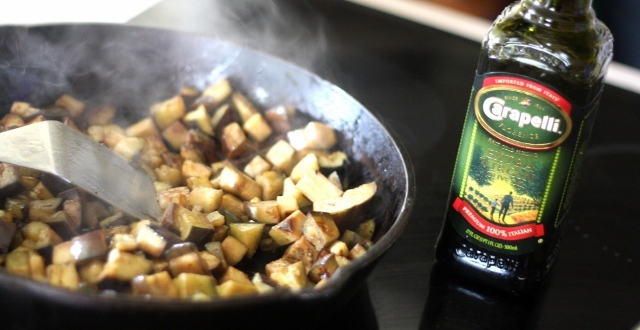 Add eggplant back into skillet. Add 1 cup of chicken broth to skillet along with the hot rice. Stir together and remove skillet from heat. Off the heat, add lime juice, cubed tomatoes and a generous sprinkle of salt and fresh-ground black pepper. 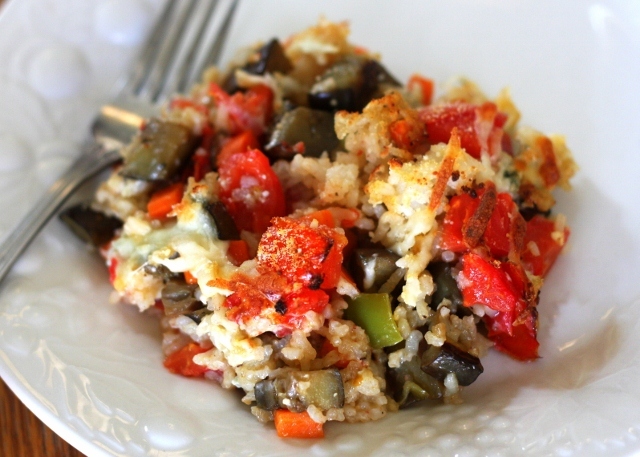 Spread half the veggie/rice mixture in an oiled 9x12 casserole dish. 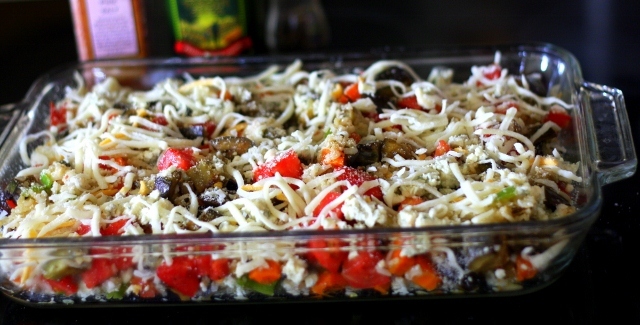 Sprinkle the casserole with all the blue cheese (or cubed mozzarella, if that's what you're using). Spread the remaining rice/veggie mixture on top. Top with a sprinkle of Parmesan, and all the grated white cheese. Bake in 425 degree oven for 10-15 minutes, or until cheese is melted and beginning to get some browned bits. Serve and enjoy! Made this tonight…it is fabulous!!! Thanks!! Hooray! So glad you liked it! I’ve heard of the salting of the aubergine (eggplant!) before,but never tried it, does it make a big difference? It pulls a little of the moisture out of the eggplant so it won’t be so soggy when it is cooked. I have skipped that step sometimes when in a hurry though, and not really noticed a big difference. Last night I made oven baked tomatoes. They were fabulous! Slow baked and yummy. The sugars condense and caramelize. I took several garden tomatoes and slit them into fourths, not through the bottom, sprinkled with salt and pepper, laid thyme and basil on top (also from garden) and drizzld a little olive oil. Baked at 325* for a couple hours, until caramelized and lightly brownd. Heaven.